It was a damp and warm day in mid-August. I stood over the gravesite and heard the locusts singing in the nearby fields. 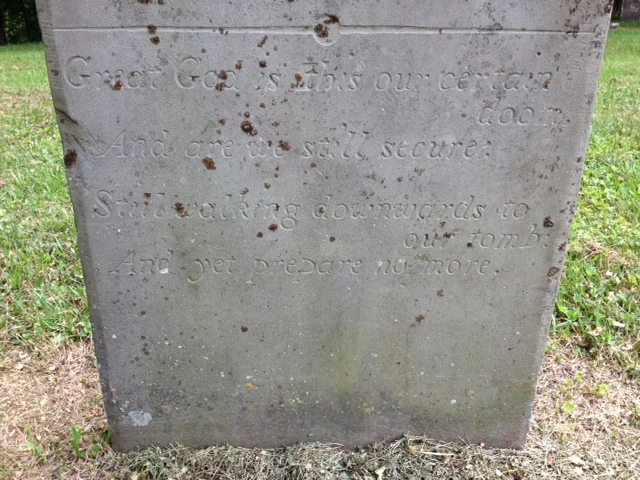 The stone was smooth, given its age and I had to drop to my knees to read the delicate epitaph on the lower half of the headstone. It was a simple rhyme with a message. But aren’t all epitaphs giving you a message? Isn’t that the whole point? To scold. To warn. To remind, yes, remind you of what your ultimate fate will be. The church stood a few meters away. It was a Baptist cemetery but the epitaph was without a promise of damnation. It was a gentle ditty with a sweet cadence. I closed my eyes. I could almost smell the musty pages of the bibles mixed with the sweat of the congregation while they sang spirituals. Perhaps a tent revival was promised for an upcoming weekend. The names and dates really didn’t matter. It was a mid 19th century stone, that I can remember. The faint traces of a weeping willow tree could still be seen. Who lay beneath the stone, under the sunken grass may have chosen the words. Maybe not. But all the same, he or she is playing out the story told in such simple words. Their worries are over. In our time, we read and pretend they are just words…not really meant for us…but they are. We all know it. And yet prepare no more. This entry was posted in Melancholy Thoughts and tagged Baptists, bibles, cemeteries, church, Epitaphs, revivals, summer heat.